This article is part of a series on the cloud journeys of various verticals, with this one focusing on cloud computing in healthcare. IT has had a huge impact on the healthcare industry: benefits of digital transformation are changing how patient data is managed, helping healthcare providers make the best treatment decisions, reducing operational costs, and much more. Behind this technology is the cloud. A HIMSS Analytics survey published earlier this year revealed that 60% of the responding healthcare organizations are using the cloud for backup and disaster recovery (up from 38% the previous year), and 51% are now using the cloud for core clinical applications and data. 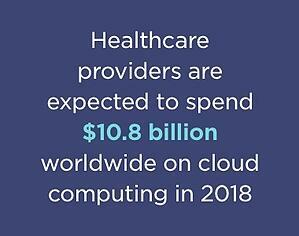 Translating this growth rate into dollars, IDC reported in June of this year that healthcare providers will spend $10.8 billion worldwide on cloud computing in 2018, with that figure expected to grow by 26.1% in 2019. A BCC Research report published in January 2018 estimates that global spending by all healthcare stakeholders on cloud computing will reach $35 billion by 2022, at a double-digit cumulative annual growth rate of 11.6% over the 2017-2022 period. In this blog, we explore the unique cloud challenges and benefits for health IT, including three success stories of healthcare IT companies that leverage the cloud with the help of NetApp’s Cloud Volumes ONTAP. The cloud offers many benefits to a broad range of healthcare stakeholders by virtue of its elastic and virtually unlimited scalability, the high availability and accessibility of data despite volume, velocity, and variety, and a desirable IT budgetary shift from capex to opex. While initial concerns about data privacy and security limited cloud adoption by the healthcare industry, those fears have been mitigated and cloud adoption has accelerated. There are numerous advantages and benefits of cloud computing in healthcare. On-demand cloud computing and storage reduces operational costs for healthcare providers such as hospitals and clinics. The cloud can also help support the data-heavy health IT technologies being used in the industry today such as electronic medical records, patient portals, mobile apps, medical devices with IoT technology, and the big data analytics behind improved decision support systems, and therapeutic strategies. The cloud has also changed the face of clinical research, with enhanced support for knowledge-sharing and clinical trial management. High data availability, robust backup and disaster recovery capabilities, supporting minimal RTOs and RPOs. Effective data security, protecting from unauthorized access and breaches. Proven compliance with regulatory frameworks such as the EU’s General Data Protection Regulation (GDPR) for the protection of personal data, the US Health Insurance Portability and Accountability Act (HIPAA) for secure data portability, and the HITRUST Alliance’s CSF, an industry-mediated certifiable standard for safeguarding sensitive information. Data Protection: NetApp Snapshot™ technology makes instant point-in-time data copies without affecting performance. Disaster Recovery: NetApp SnapMirror® provides quick and efficient data replication for seamless backup, disaster recovery, and data mobility across hybrid infrastructures. Significantly reducing cloud costs with built-in data storage efficiencies—compression, deduplication, thin provisioning. Volume cloning technology instantaneously creates a writable, point-in-time copies of volumes without using additional disk space, useful for dev/test requirements for health IT vendors as well as for data analytics for healthcare researchers and insurers. Automated storage tiering for cost-effective storage of “cold” data while keeping “hot” data accessible to clinicians, patients, and more. Secure, encrypted data across the entire NetApp data fabric. In the next section, we’ll take a look at three case studies where Cloud Volumes ONTAP helped companies in the healthcare industry fully leverage the added-values of cloud computing in healthcare. The health IT trends are leading more and more businesses to take advantage of cloud computing in healthcare. Below are three stories about companies that did that with the help of Cloud Volumes ONTAP. AdvancedMD provides cloud-based practice management solutions for small- to mid-sized medical practices, including billing, electronic medical and health records, and telemedicine. AdvancedMD was initially part of ADP. When it was decided to spin off AdvancedMD on its own, the company had to quickly establish a data center of its own in the cloud. The data they handle is highly sensitive and subject to strict regulations regarding safety, privacy, and availability. After a quick deployment, they were able to easily lift and shift their data into AWS and transform their storage costs into a manageable monthly expense using the pay-as-you-go model. Cloud Volumes ONTAP’s intuitive, single-pane data storage management interface eliminated the need for in-house storage experts. Built-in Cloud Volumes ONTAP storage efficiencies such as compression, deduplication, thin provisioning and automated storage tiering reduce their storage costs. Enterprise-level data protection allow them to recover quickly and without data loss in the face of an outage. Cloud Volumes ONTAP’s automation and orchestration capabilities let them scale up and down painlessly in response to dynamic customer requirements. The customer in this success story is a veteran cancer research institute that, with its faculty of 300+ researchers, translates discoveries into therapies that aim to eliminate cancer and related diseases as causes of human suffering and mortality. The business challenge they were addressing was to reduce the footprint of their on-premises data center by moving backup and disaster recovery to the cloud. The solution was a seamless integration of a Cloud Volumes ONTAP instance for Azure and the Microsoft Azure Site Recovery (ASR) service. Using Cloud Volume ONTAP’s highly efficient SnapMirror data replication feature, the customer’s data is continually synced and securely protected on Azure. This multinational corporation researches, develops, and manufactures innovative medicines, vaccines, and consumer healthcare products. Currently, the company is operating across 150 different countries around the globe, with close to a hundred R&D and manufacturing sites worldwide. The company faced the seemingly impossible task of shutting down a major data center within 40 days, including web servers that serve files to 900 individual websites. They wanted to transition the production and non-production, with both NFS and SMB/CIFS workloads to a highly available File Service storage solution on AWS. The solution was to implement Cloud Volumes ONTAP HA instances on AWS for production and non-production workloads, which were seamlessly integrated with the company’s shared Apache web servers. The data center was vacated in five weeks, from first demo to production processing, and the customer is benefitting from resilient and efficient NFS and CIFS services on AWS, providing seamless support for all of its websites. NetApp Cloud Volumes ONTAP is the optimal data storage management platform for the healthcare industry. It allows stakeholders across the entire health IT spectrum—vendors, providers, insurers, patients—to safely, reliably and cost-effectively leverage the benefits of the cloud. The healthcare companies mentioned above found a way to benefit from cloud computing for healthcare, now so can you. Enhance your cloud computing opportunities with a 30-day free trial of Cloud Volumes ONTAP on AWS or Azure today.